Treating yourself to a cupcake at Disney World is one of the great joys in life, but what if I told you that cupcake was free? That would have to be one of the greatest joys in life, now wouldn’t it? There are a few ways to currently make this a reality at the recently opened Sprinkles at Disney Springs. Here’s how to score one of the best cupcakes around for free. The simplest way to get a free Sprinkles Cupcake is by signing up for their loyalty program called Sprinkles Perks. There are a lot of benefits to the program, like getting a free cupcake for every 15 you buy. However, the best part is that Sprinkles has been running a promotion where you get your first cupcake for free upon signing up. Signing up is easy, just head to the Sprinkles Perks website. 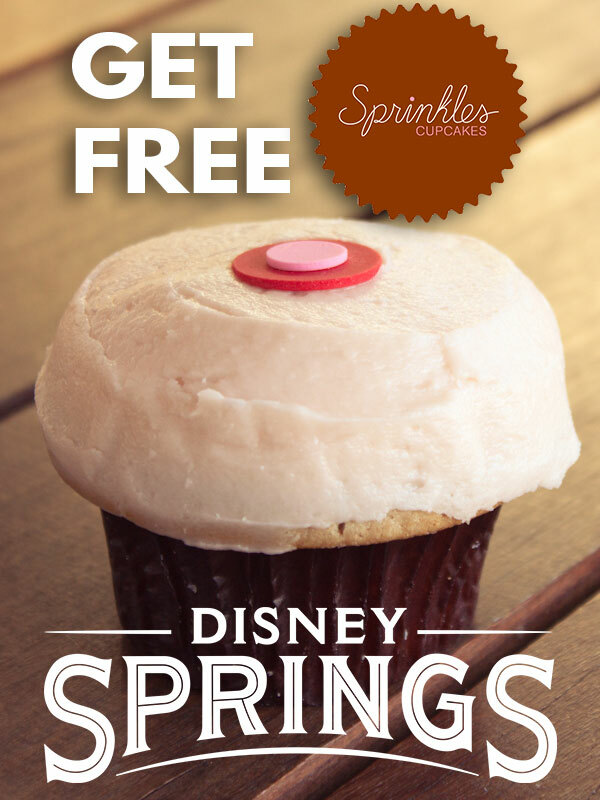 Sprinkles is running a couple of BOGO promotions this month that will give you more opportunities to get a free cupcake. BOGO deal: From June 1 – 19, guests will be able to get a “buy one get one free” item. To do so, guests just have to bring in a previous purchase receipt within one week from receipt date. Father’s Day, June 19: For dads who visit Sprinkles with their kids, they will receive a free menu item, so your choice of cupcake, cookie, sundae, scoop, or shake, free with a purchase of another menu item. So, if you took advantage of every promo laid out here, you could get 4 extra cupcakes for free (5 if you can swing the half-birthday thing, and 16 if you go to Sprinkles over 40 times in a year). Sprinkles runs promotions all the time. Follow their Twitter account to keep track of other promos. Want other free things during your WDW vacation? Check out our article about the Best Freebies at Walt Disney World to find out what other perks you can get for free while you visit Orlando.